Autodesk announced new subscription pricing for Flame starting at $750 per month and can be accessed annually for as low as $500 per month. Autodesk also announced Flame support for OS X as part of the Autodesk Flame Extension 2 release, available later this month. Autodesk Flare and Autodesk Flame Assist software are now available as standalone products with monthly subscription prices, starting at $400. With these changes, Autodesk is evolving the entire Flame Family to meet the needs of a growing base of creative professionals including freelancers and smaller facilities that need access to powerful 3D visual effects and finishing tools to tackle tough jobs. The new subscription offerings provide a lower cost for facilities expanding their creative capabilities and for smaller studios and individual freelancers who work on a project basis. Autodesk plans to continue to sell perpetual licenses of Flame Family. — Early next year: sales of Flame as a turnkey system will discontinue. — Today: Flame will be available as a software only product. Customers can choose their own qualified Linux hardware. — Late November: license Flame on the Apple Mac OS X. Recommended configuration specifications for Flame running on OS X will be available soon. Autodesk has also announced the upcoming Flame Family 2016 Extension 2 release that will be available to customers later this month. It brings new format support and stunning performance gains in color grading workflows. Lustre Reactor brings new GPU acceleration to color grading workflows and significantly improves performance when using blur, keying and softness controls for both preview and rendering operations. Other enhancements in Lustre include 32-bit floating point GPU rendering locally, via Shot Reactor and when using Autodesk background rendering software; performance enhancements when working with Open EXR source media with embedded mattes; UI support for high DPI monitors (4K); and new Print View and Print LUT support when using AJA SDI output. Across the Flame family of products, when importing media, artists can take advantage of new support the full DNxHR media family by using either QuickTime or MXF containers, as well as updated support for R3D media files including R3D SDK 6.0.3, allowing Flame to directly support the new Dragon 6K sensor and Rec 2020 color space. When exporting media, the extension supports Sony MPEG-4 Part 2 Simple Studio Profile (SStP) encoding in an MXF wrapper, supporting a variety of formats and presets. As of today, the 2016 versions of Flame, Lustre, Flare and Flame Assist are available for purchase as software subscription only through an Autodesk Reseller or Autodesk Sales Representative. 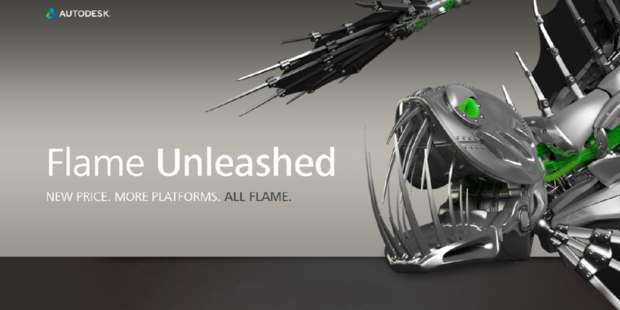 For more information, visit autodesk.com/FlameUnleashed.